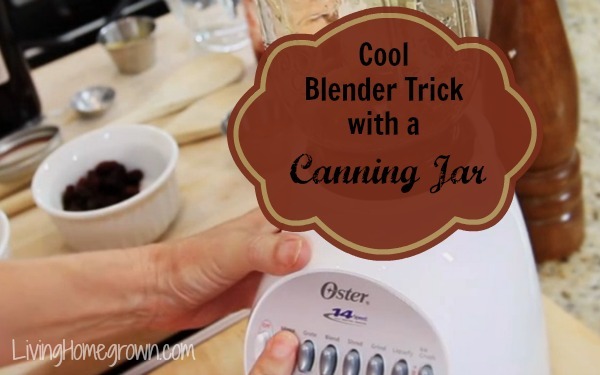 Steal This Canning Jar Trick and Share It! I’m on a mission to use up the last of my previous season’s jams over the next few months. For me, that means a lot more jam salad dressing. Share This Trick with Your Friends! Everyone with a canning jar needs to know how to do this. P.S. Don’t worry – If you are subscribed to my updates, I will let you know of future canning posts/videos happening on our TV show. Just be sure to subscribe here. Here’s a link to the original post (with a Jam’n Dressing Recipe) over at Growing A Greener World TV. I used to have an Oster blender, and I used to do similar things with pint-sized jars and had no problems. Then I got a new blender–Black & Decker–and ran into problems. While the collar fit, the blender blade was not raised up high enough inside the jar to avoid scraping it. I wound up with cracked jars! Patricia – Thanks so much for this info! I no longer have my 1968 Osterizer, but when it died, I kept the small 8-oz jars. I even still have the original lids, although I’ve never used the lids, just the jars.